In collaboration with Cinema Akil and the #NOWPLAYING programme. The film offers a panoramic view of the modern history of Palestine through the unseen lenses of unsung protagonists. Mohanad Yaqubi's long-awaited feature debut presents a rapid, non-didactic visual history carefully assembled over seven years of research in archives Paris, Rome, London, Amman and Beirut. “ … and for those who suffer from invisibility, camera would be their weapon.” “Off Frame AKA Revolution Until Victory” traces the fragments of a revolution, splicing images then from a dream for freedom, using films from the Palestinian struggle cinema, a term used for films produced in relation to the Palestinian revolution during the period between 1968 and 1982. For the outside world, these films represented a model of a people in struggle, explaining why they are fighting and against whom. But for Palestinians these films marked the transformation of their identity, from a refugee to that of a freedom fighter. wither its staged or not, wither its personal or collective. The film borrows moments from a selection of militant films. These shots were edited together in one timeline , the only coherent relation between all the shots, clips, sequences is that they all lay on the boarders between fiction and propaganda, dream and reality, in order to represent a narrative of a people in struggle. 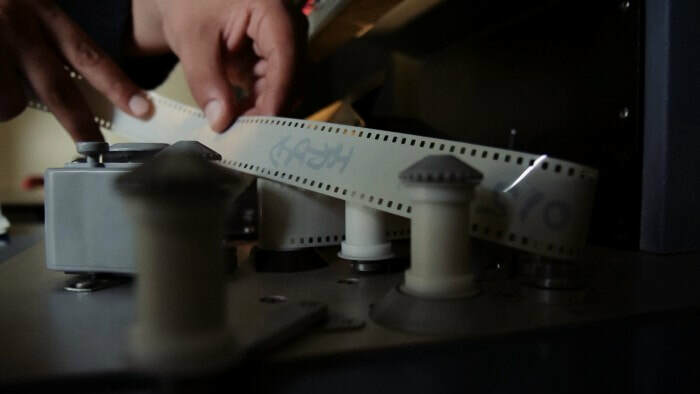 As history is written/recorded while the camera rolls, the film negative not only captures what is before the camera, but it also indicates to what is missing from its cadre. 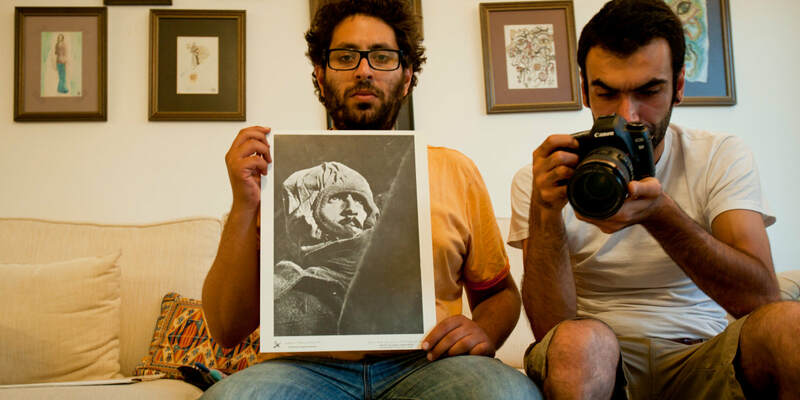 The Palestinian revolution collaborated with filmmakers, actors and activists from Syria, Italy, UK, Lebanon, France, Germany, Argentina amongst many others, and made partnerships with institutions in Berlin, Moscow, Baghdad and Cuba. Despite their prolific output, very few of their works remain. 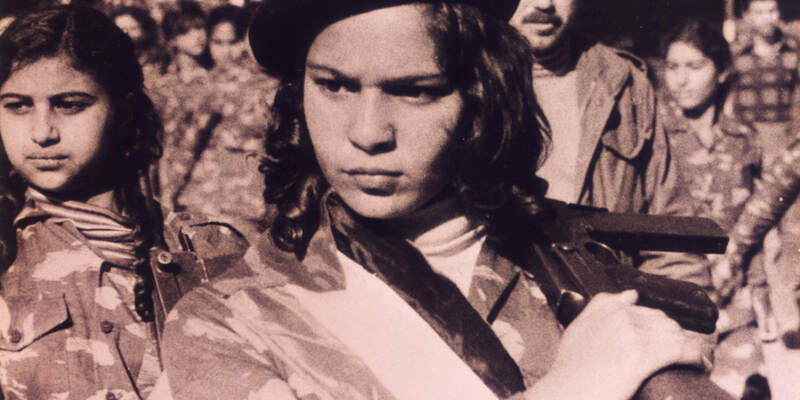 Yet there is much to learn from revisiting this era and piecing together the narrative of Palestinian militant cinema. “Off Frame” aims to fill this gap in the collective memory, making the past an urgent element of the present day analysis of Palestinian cinema. The film attempts to bring forth all that was happening behind the cameras and the creation of these films. Resorting to cinema’s temporal nature and time being an elastic concept, “Off Frame” assumes the role of a time machine, transporting the audience back in time, by opening a portal into the life, hopes and desires of a people living in a revolution, fighting to be recognised and to reclaim control over their representation.